It's late February and winter is nearly over. The Northwest has just been hit with yet another snowfall. Meanwhile the crew at Mixed MEDIA publishing has spent the last four months wrapping up work on a new book release. Spring is on the way and with it arrives the new baby tailor made for dual sport enthusiasts. Sound RIDER! publisher Tom Mehren has authored this new release, Dual Sport Rides Through Western Washington, which unlocks the locations and routes for 28 dual sport rides through the state. The book, unlike any other on the market today, is scheduled for an April release. SR! : What was the inspiration for the book? TM: It was a series of events that took place over the last seven years. In 2002, I completed a restoration on a 1972 Honda SL350. I hadn't owned a dual sport bike since 1990 when I was living in California. I broke in the restoration on the Mountain Loop Highway and proceeded to blow the left cylinder on the return trip to Seattle. We fixed it but it was obvious this was not going to be the dual sport bike for routine rides in the area. I purchased several newer models and started riding quite a bit in the spring, summer and fall. 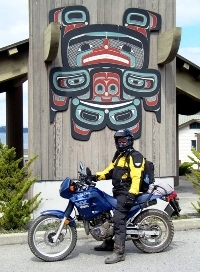 About 2004, I initiated the Puget Sound Dualsport Enthusiasts and began riding with others and exploring the roads Western Washington had to offer. I would create maps for each ride and provide them to whoever showed up to breakfast on the ride days. Eventually I had quite a few maps on file and later began working up GPS files. By 2007, I realized I had enough material for a book project. SR! : The book begins with a series of rides in the Columbia River Gorge, a place you're familiar with from your efforts in putting on the Dualsport Northwest rally each summer in Stevenson. Are these the same routes from the Gorge Guide you've previously offered? AVAILABLE NOW! Order your copy today online. Simply CLICK HERE to place your order now. TM: No. That would have been the easy way out, but the fact is the area is rich in great rides and I decided to pull together five entirely different rides for this book. If you owned both books you'd have about a dozen dual sport routes in the Columbia River Gorge region. SR! : How did you arrive at 28 rides? TM: The original plan was to go with 25. However, as we worked through the rides it was apparent we were leaving behind a seldom-ridden area, the Winthrop and Conconully areas. It was more work, but I didn't think the book would be complete without including them. SR! : The book includes a discussion of maps, GPS and general navigation topics. Is this book all one needs to do the rides? TM: I don't think there's any single book, map or other navigation tool that makes a ride the best it can be. The book provides you with the ride background, basic maps and turn-by-turn directions, but I'm a big believer in having a Benchmark road atlas to augment what I see in a book and a GPS goes a long way in providing turn-by-turn directions as you ride, rather than following the scripts in the book. SR! : So are there going to be GPS files available? TM: Yes, like the Columbia River Gorge book we've worked up the GPS files in both MapSource and GPX formats. They will be made available as a collective option that can be purchased online. SR! : What's your favorite ride in the book? TM: I guess that depends on the weather. My goal here was to create routes that included great scenery along the way so you weren't just riding around on dirt roads from one place to another. We made every effort to get you up to high elevations with stunning views. From the mini railroad lookout over Icicle Creek near Leavenworth to the stunning overlook on Monte Christo Ridge in Skamania, the book suggests you carry your camera with you at all times. SR! : Most rides range between 50 and 100 miles. How did you arrive at these numbers? TM: The idea was to provide the rider with both a morning and afternoon ride. Most rides begin and end in areas where services like food and fuel are nearby. Since the longest ride is 100 miles, fuel for most bikes shouldn't be an issue. SR! : The roads all look pretty doable by a newbie or intermediate rider. What's the most challenging road in the book? TM: That can vary from season to season, but we purposely left out the ridiculous stuff like Colockum Pass and the silt around Beehive for instance. The inclusion of Hog Ranch Road is probably the roughest 9 miles of the book. I'd like to have included the Barber Springs Road as an alternative to that, but the road has proved to be unreliable over the years. We purposely didn't include any single track in the book so that all the routes could be done by an adventure rider, not a just a dual sporter. SR! : The book is loaded with photos. How long have you been shooting to get these together? TM: Ever since the break-in ride on the Mountain Loop Highway back in 2002. In the business I'm in, I see a lot of travel articles in various magazines and often the pictures are just some twisty road that could be anywhere and maybe a parked bike in the shot. Western Washington is an exceptional place to ride. The views and the roads are great. I felt it was important to include both scenery shots as well as riders partaking in the rides. There are posed group shots, single rider shots and a variety of other photos. With a seven-year-old archive, I was able to add a lot more diversity to the photo offerings in the book. SR! : Is that you on page 96 taking a leak on the Cash Prairie? SR! : The Slate Peak ride looks like a simple out-and-back. Why was it included in the book? TM: It's the highest place you can ride a motorcycle in Washington State. The elevation gain is 5400 feet over 21 miles so it's not just a basic out-and-back. You'll need to be in shape to get to the actual top as it's a three-quarter-mile hike to the top of the peak from the parking area. SR! : The book is priced at $24.95. How did you arrive at that price? TM: It's funny, we talk to some people who think the price is too high, is just right or too low. Book pricing is subjective in the mind of the individual buyer. I look at all the work for seven years that has gone into creating the content, how much money was spent out riding on fuel, accommodations and service work. In comparison to paved counterparts, the price is a steal. It comes out to under a dollar a ride. Compare that to the price of a movie or other entertainment. We know of one person who sells a single ride for $50. Wow. TM: In 2005, I rode the Oregon Back Country Discovery Route and was very disappointed. The route was excessively rugged in some places; had little to offer in the way of views; was short on food, fuel and camping/lodging locations and was more frustrating than fun. Few riders ever complete it in a single try. That inspired me to come up with a Washington Back Country Discovery Ride. While researching and putting together this book, we came up with just such a ride laid out with doable 125 mile days; plenty of food, fuel and accommodations along each segment; and some stunning views for each of the nine segments. I'm hoping to complete the guidebook, maps and GPS files by early summer. SR! : Do you foresee authoring books on Eastern Washington, Idaho and/or Oregon dualsport rides? TM: A few things would factor into that happening. Time, the success of this book and how much Aleve I can get my hands on.